If you consider yourself an Obama Mama then you may want to grab some gear, especially as this election heats up and moves forward. 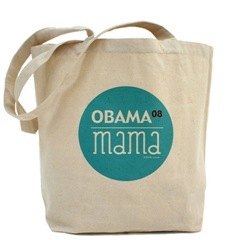 One of our my favorite sites, Mamazine, has created an Obama Mama tote and tee. Mamazine will donate all proceeds from sales made before November 4, 2008, directly to the Obama for America campaign. Buy some gear today, make your favorite OBAMA mama happy, and help spread the word!